Yes, a carefully brewed pour-over is glorious. And silky, rich espresso from a machine that looks to be distantly related to a Ferrari, nirvana. There’s also the tinny-but-charming old-world moka, cold brew magic and other chemistry set coffee wizardry. But the auto drip filter, still the most ubiquitous method in most countries, has carried a pall of inferiority for too long, its stigma invariably conjuring up the indifferent sludge of late-night diners and truckstops. With a little care and a halfway decent machine, though, perfectly good filter coffee is possible. Though it certainly can’t trump other, more deliberate methods for out and out flavor, a couple tweaks to your auto drip technique can make for many cups of drinkable, satisfying and convenient joe. Still, it is more of an active process than dumping in some Folgers and hitting brew. As for your machine, what you already have is probably fine. Still, if you’re looking into something new, there are a few things to keep in mind. As with any tool, don’t skimp: cheapo coffeemakers are sloppily made and don’t get hot enough to brew properly. No need to break the bank, either, with a techno gizmo with built in wifi or LED tricks. Instead, opt for something solid and without gimmicks—Made in Germany is always safe. 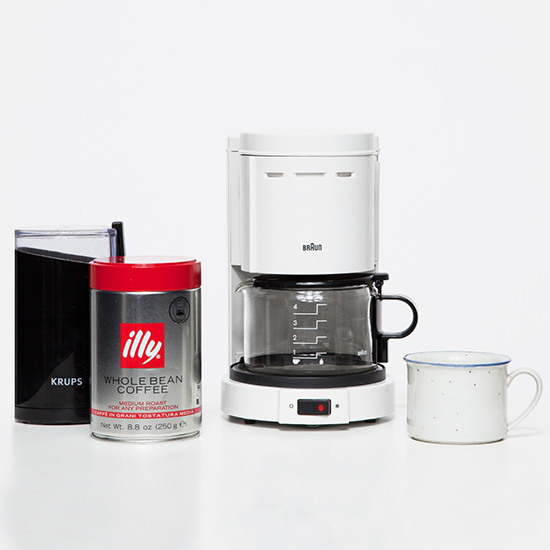 The 90’s era Braun Aromaster we’ve used here is supremely minimalist—its only button is an on/off toggle—but it’s well-built, brews quickly, and its small-batch 4-cup capacity means you’ll drink fresher coffee and waste less in the long run. Here are a few simple steps for making much better drip coffee. 1. Keep your machine clean, inside and out. It may sound like a no-brainer, but calcium deposits and other gunk can make for bitter, not to mention, icky brew. Once per month, it’s a good idea to deep clean your machine by running through a mixture of 1 part vinegar to 2 parts water as if you were brewing a whole pot. Once brewed, run the mixture through a second time for maximum clean. Follow up with a pot of plain water to rinse. If you’re brewing with a machine that hasn’t been cleaned in a while, it’s a good idea to do this right away. 2. Use quality coffee. As with any brewing method, raw material is essential. No need to spring for the ultra-premium $$$ stuff, as the drip technique wouldn’t really make the most of its subtle complexities, but a good premium brand like Illy or a favorite from your local roaster will walk all over that tin of Yuban. 3. Buy quality coffee, whole. Pre-ground is a no-no. There are differing schools of thought regarding the best type of grinder—burr or blade—but their various effects really only become perceptible when using more deliberate or delicate brewing techniques. For filter coffee, what’s important is that you wait until just before you brew to maintain the fullest flavor. 5. Rinse your filters thoroughly. This doesn’t apply when you’re using a permanent gold mesh filter, but rinsing paper filters with cool water before you brew primes them for filtration and can get rid of tiny impurities. 6. Turn the heat off, stat. Pour overs owe at least part of their superior taste to the fact that they’re brewed and then allowed to settle into their flavour without disruption. Drip coffee, on the other hand, is brewed onto a carafe sitting on a hot element which keeps the coffee at a constant near-boil. You’re safe if your machine has an insulated carafe, but glass is A-OK as long as you turn the heat off (or better yet, remove the carafe from the heat) as soon as brewing is done.